Staff Sgt. 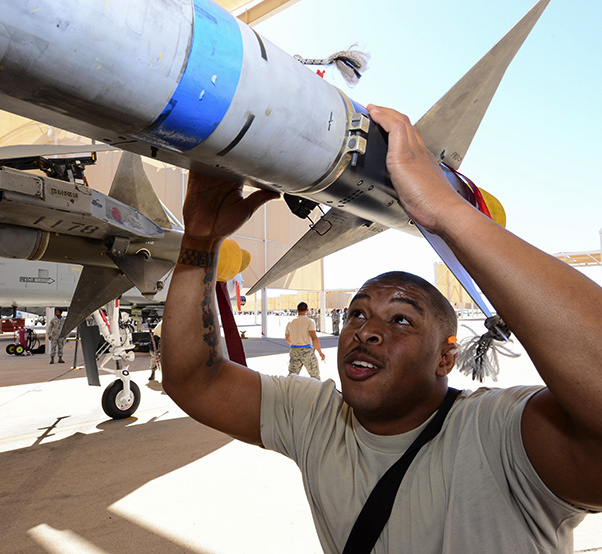 Leon Jones, 354th Aircraft Maintenance Unit weapons load crew chief, inspects an AIM-9 Sidewinder missile that was loaded onto an A-10C Thunderbolt II during a load crew of the quarter competition at Davis-Monthan Air Force Base, Ariz., Oct. 7, 2016. 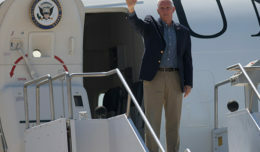 The load crews were evaluated based on timeliness and deficiencies during the contest. Airman 1st Class Edgar Baez-Lopez, 355th Aircraft Maintenance Squadron weapons load crew member, sets the ejector feet on the loaded station of an A-10C Thunderbolt II during a weapons load crew competition at Davis-Monthan Air Force Base, Ariz., Oct. 7, 2016. This quarter’s weapons load crew competition was between the 354th, 357th and 924th aircraft maintenance units. 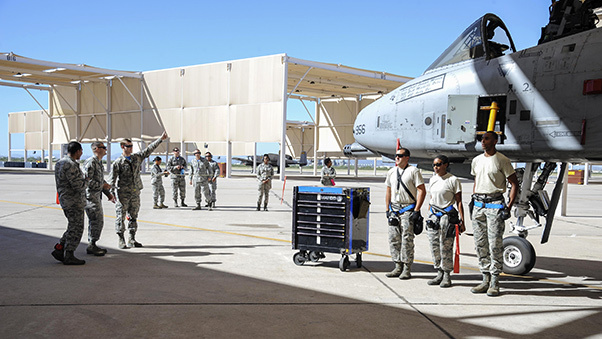 Airmen assigned to the 354th Aircraft Maintenance Unit stand at attention before a load crew of the quarter competition at Davis-Monthan Air Force Base, Ariz., Oct. 7, 2016. 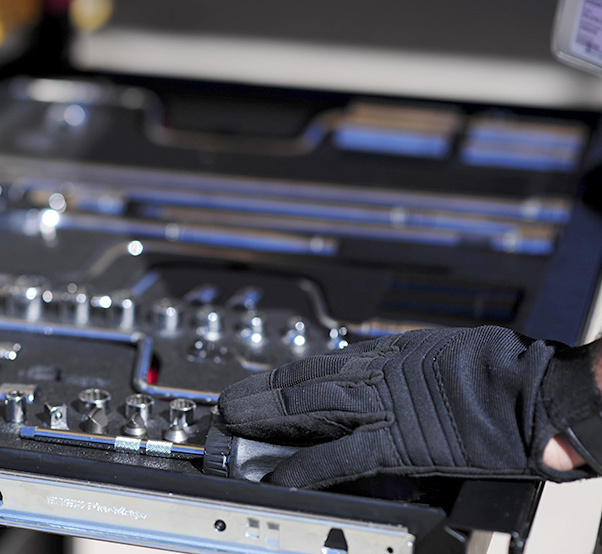 This quarter’s competition was between the 354th, 357th and 924th aircraft maintenance units. 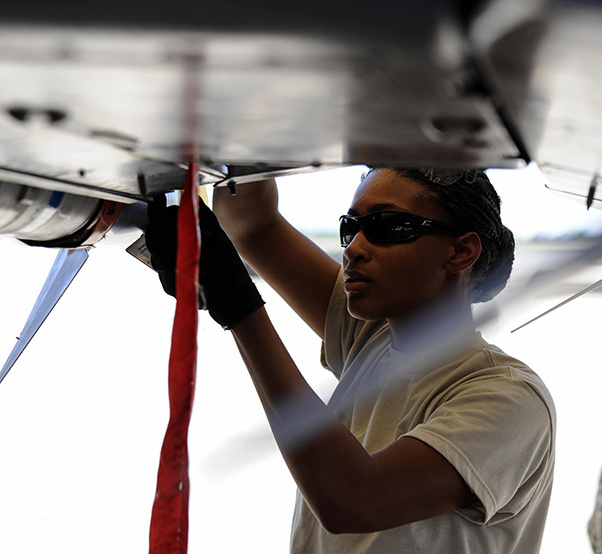 Airman Brittany Wade, 354th Aircraft Maintenance Unit weapons crew member, loads an AIM-9 Sidewinder missile onto an A-10C Thunderbolt II during a load crew of the quarter competition at Davis-Monthan Air Force Base, Ariz., Oct. 7, 2016. The objective of the contest is to determine which team can most efficiently load munitions onto an A-10. 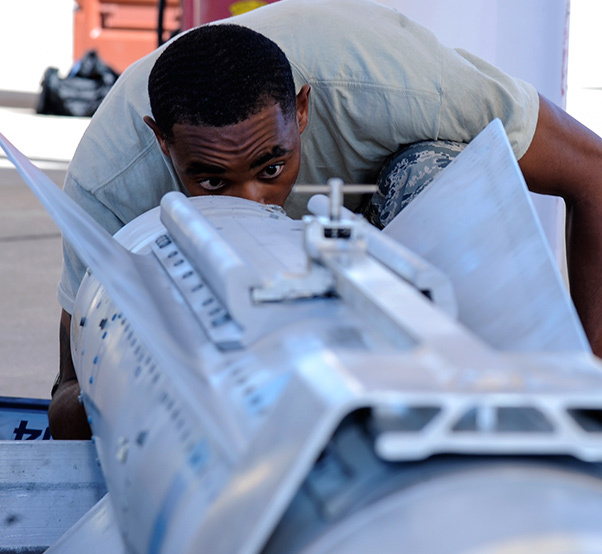 Senior Airman Jamal Williams, 354th Aircraft Maintenance Unit weapons crew member, inspects an AGM-65 Maverick missile before loading it onto an A-10C Thunderbolt II during a load crew of the quarter competition at Davis-Monthan Air Force Base, Ariz., Oct. 7, 2016. This quarter’s weapons load crew competition was between the 354th, 357th and 924th aircraft maintenance units. 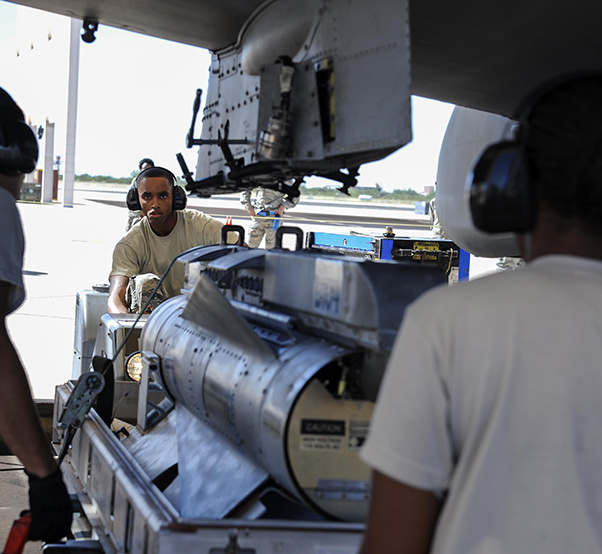 Senior Airman Jamal Williams, 354th Aircraft Maintenance Unit weapons crew member, utilizes a MHU-83 bomb loader to load an AGM-65 Maverick missile onto an A-10C Thunderbolt II during a load crew of the quarter competition at Davis-Monthan Air Force Base, Ariz., Oct. 7, 2016. The load crews were evaluated on timeliness and deficiencies during the contest. 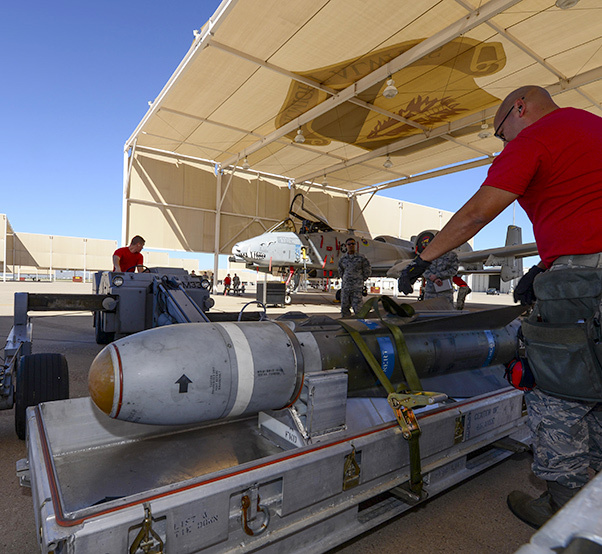 Airmen from the 355th Aircraft Maintenance Squadron check an AGM-65 Maverick missle for damage and serviceability during a weapons load crew competition at Davis-Monthan Air Force Base, Ariz., Oct. 7, 2016. 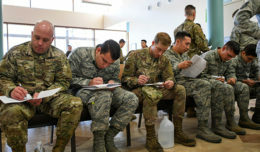 This quarter’s competition was between the 354th, 357th and 924th aircraft maintenance units. Staff Sgt. 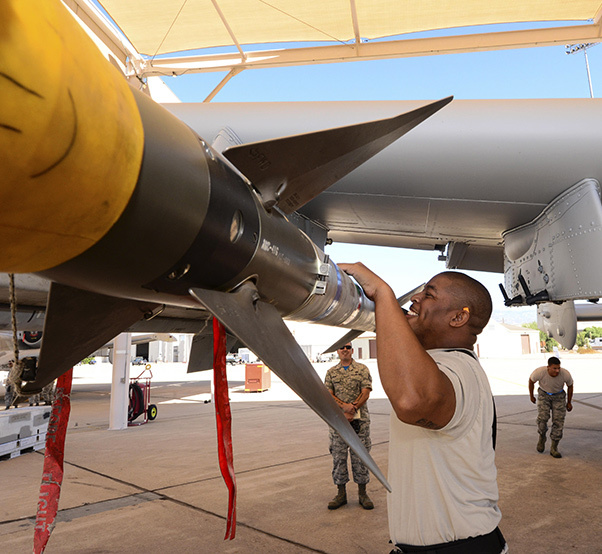 Leon Jones, 354th Aircraft Maintenance Unit weapons load crew chief, inspects an AIM-9 Sidewinder missile that was loaded onto an A-10C Thunderbolt II during a load crew of the quarter competition at Davis-Monthan Air Force Base, Ariz., Oct. 7, 2016. The objective of the competition is to determine which team can most efficiently load an A-10 with munitions with the least amount of deficiencies. 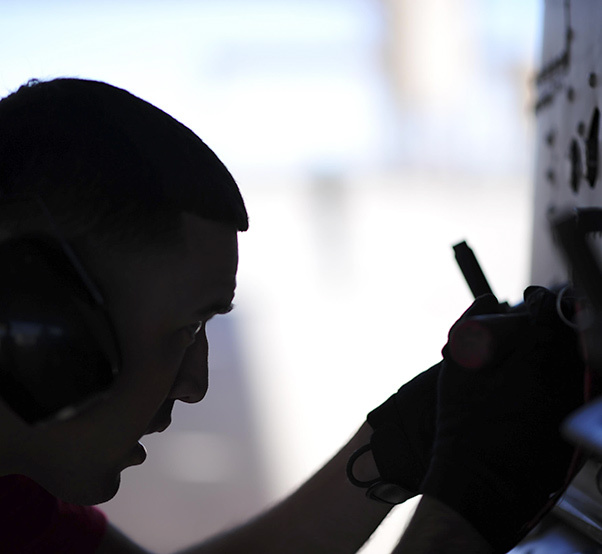 Airman 1st Class Edgar Baez-Lopez, 355th Aircraft Maintenance Squadron weapons load crew member, prepares the station of an A-10C Thunderbolt II for equipment download during a load crew competition at Davis-Monthan Air Force Base, Ariz., Oct. 7, 2016. 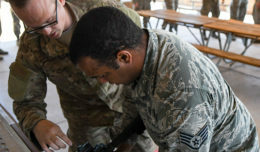 This quarter’s weapons load crew competition was between the 354th, 357th and 924th aircraft maintenance units. 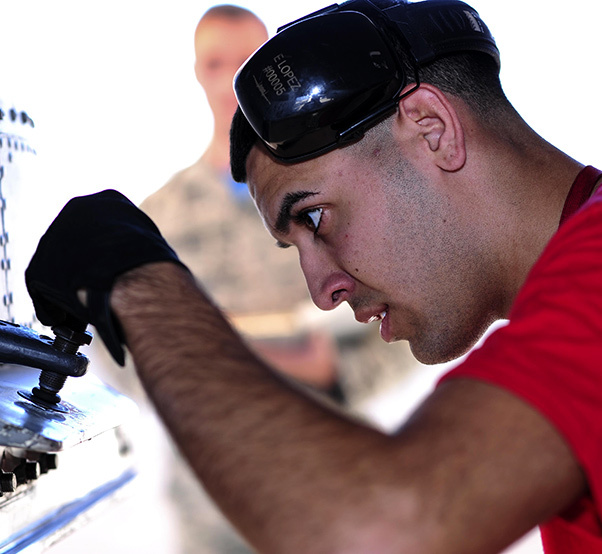 Airman 1st Class Edgar Baez-Lopez, 355th Aircraft Maintenance Squadron weapons load crew member, performs a tooling accountability check during a weapons load crew competition at Davis-Monthan Air Force Base, Ariz., Oct. 7, 2016. This quarter’s weapons load crew competition was between the 354th, 357th and 924th aircraft maintenance units. Staff Sgt. 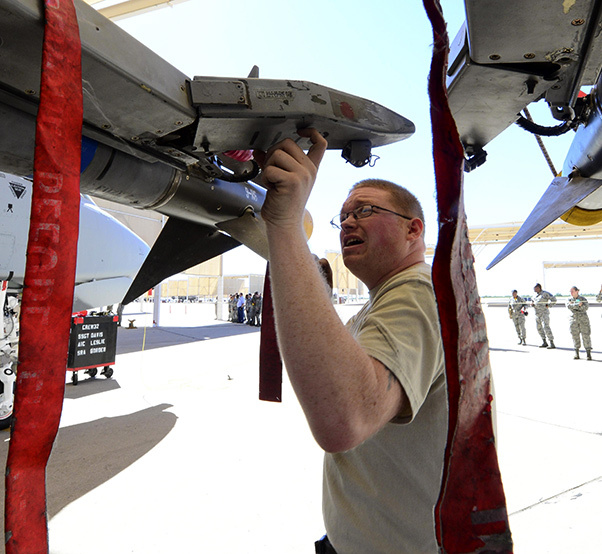 Casey Frye, 354th Aircraft Maintenance Unit weapons load crew member, inspects an AIM-9 Sidewinder missile that was loaded onto an A-10C Thunderbolt II during a load crew of the quarter competition at Davis-Monthan Air Force Base, Ariz., Oct. 7, 2016. The objective of the competition is to determine which team can most efficiently load an A-10 with munitions with the least amount of deficiencies. Staff Sgt. 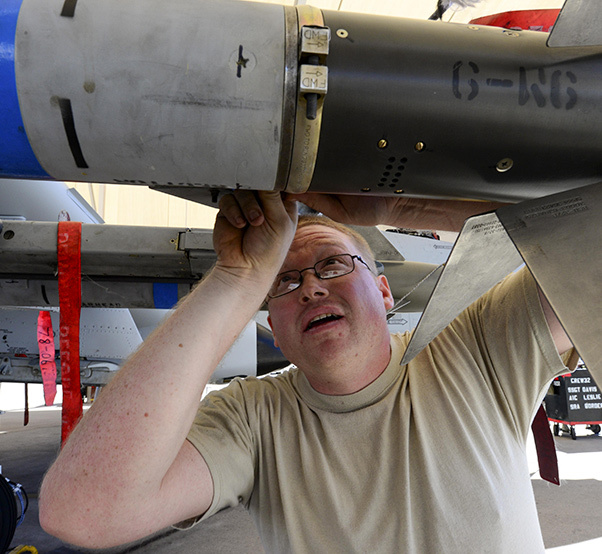 Casey Frye, 354th Aircraft Maintenance Unit weapons load crew member, inspects a missile rack after an AIM-9 Sidewinder missile was loaded onto an A-10C Thunderbolt II during a load crew of the quarter competition at Davis-Monthan Air Force Base, Ariz., Oct. 7, 2016. The load crews were evaluated based on timeliness and deficiencies during the contest.